This watch, Waltham P.S. Bartlet made in 1864, a genuine relic of the U.S. Military Telegraph Corps and really belongs in a museum devoted to the history of communications and telegraphy. It is by pure chance that I have the great fortune and honor to own this fine watch. 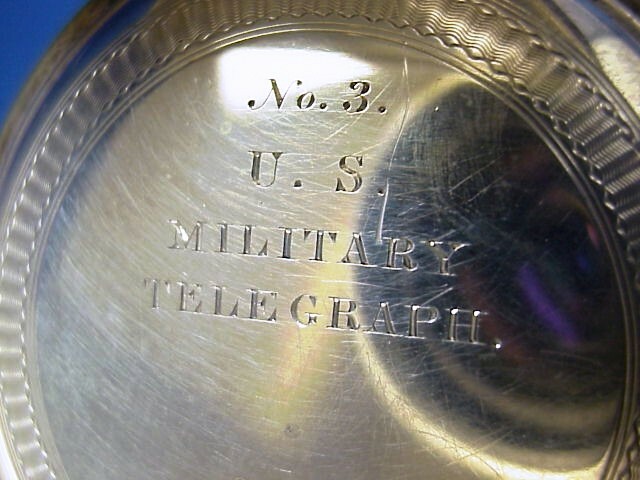 The U.S. Military Telegraph Corps was formed in 1861 following the outbreak of the American Civil War. David Strouse, Samuel M. Brown, Richard O’Brian and David H. Bates—all from the Pennsylvania Railroad Company—were sent to Washington, D.C. to serve in the newly created office. In October of that year, Anson Stager was appointed department head. They were charged with maintaining communications between the federal government in Washington and the commanding officers of the far-flung units of the Union Army. As such, they played a large part in intercepting and deciphering Confederate communications. 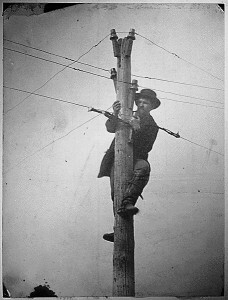 A member of the U.S. Military Telegraph Corps tending to the all-important wires. The USMT and the Signal Corps (which used flags, semaphore and lights to signal) were, at the upper echelon’s, often in bitter dispute over control of the communications during the war. As with all armies, at the lower operational level, the men and women of the USMT and the Signal Corps most often got along and co-operated well. It is a credit to both services that the individuals who performed the work did so under very adverse military and political pressures. Although the members of the USMT were often paid much more than the members of the Signal Corps (and yet considered themselves underpaid and even “struck” for higher wages), they were never considered members of the military organization and as such were denied the benefits of a pension and the considerable political power at the local “at home” level. Conversely, the members of the Signal Corps were often derided by the political powers running the USMT as being inferior in both ability and actual function. In truth, the functions were very often different. The USMT handled logistical and strategic communications at the Grand Tactical and Strategic level. 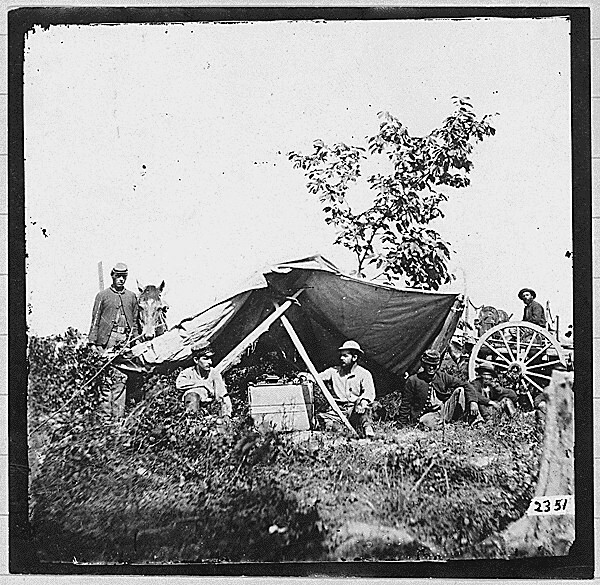 The Signal Corps operated at the Tactical and Grand Tactical level, with the latter very evident at Fredricksburg and Chancellorsville. The former was obvious at Gettysburg, to name but one instance. It was when an effort was made to blend the functions that the conflicts flared up. In the end, each service bled and died, and whether it was by direct or indirect fires mattered little. In the West these functions were sharper and clearer over the vast distances. One can clearly see the telegraph stretching forward and backward during the Grand Tactical movement of Gen. Sherman (who had his own pocket telegraph set) as he executed the first and, perhaps, best example of the Indirect Strategic Approach on the American continent. Across that 40-mile-wide front were the flags and torches of the Signal Corps, performing much as did the Confederate Signal Service, gathering and dispersing information and coordinating the widespread units. In the East, during this same time frame, the Signal Corps was relegated to observation, while the United States Military Telegraph operated, perhaps, right down to the brigade level. This was the time of Petersburg and trench warfare. A telegraph operation set up in the field. The telegraph was used during the Civil War by Union forces to coordinate widely dispersed units. In a twist of irony, when the war ended, the civilians who ran the USMT decided that they wanted nothing to do with the telegraph lines utilized by the military out west and the service was turned over to the Signal Corps. Much of this had to do with the USMT “brass’” failure to make money speculating on events in the West. This venal trait of the upper echelon of the USMT was never more in evidence than the close relationship of Thomas T. Eckert with the extremely sharp speculator Jay Gould. Eckert routinely provided Gould with information passed over the “secure” USMT circuits. Gould used this information for his speculations in railroads in the occupied areas and in gold by betting against the dollar with advanced knowledge of a Union defeat or for the dollar by using advance knowledge of a Union victory. The failure of the USMT to pass this information to Gould during the battle of Gettysburg was infuriating to him and he demanded that Eckert correct the situation. The movement to take over the Signal Telegraph system of deploying wire was given a strong boost with Gould money. Soon the Signal Telegraph would cease to exist and the control of the content over the lines would pass to Eckert, and thus to Gould. By 1865, Gould had parleyed $50,000 into several million dollars. Of course, none of these transactions were known to the brave and talented individuals who made up the bulk of the United States Military Telegraph. To them are due much honor and fame. They represent a critical chapter in the history of the telegraph. The watch pictured in this article is a genuine relic of the USMT and really belongs in a museum devoted to the history of communications and telegraphy. It is by pure chance that I have the great fortune and honor to own this fine watch. It is a Waltham P.S. Bartlet, serial number 123,606, dating its production to late January or early February of 1864, which means it most certainly saw service during the War between the States. Waltham produced many thousands of watches during this period, but relatively few actually saw service in the war, and fewer still have survived. The P.S. Bartlet was Waltham’s second quality or grade of production watch, deemed more than suitable for timekeeping service for the wartime communications of the time. The watch has 15 jewels (white sapphires) in screwed-in jewel settings, lever escapement with a monometallic gold balance wheel, uncompensated, 30-hour run time, and is key wound. It is an 18-size full-plate model 1857. 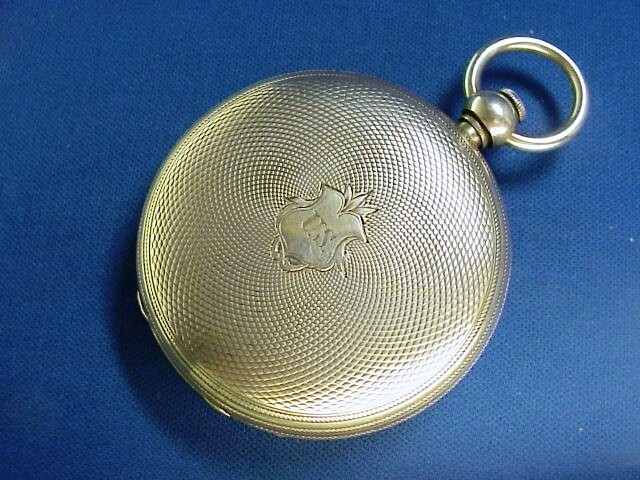 The watch is housed in its original coin silver hunting case with beautiful and functional “Barley Corn” engraving. The engraved surface of the Watch actually made the watch less likely to “slip” from the hand when handled. The watches’ timekeeping capability is quite poor by today’s standards and was only slightly above average for the standards of the time 1864. 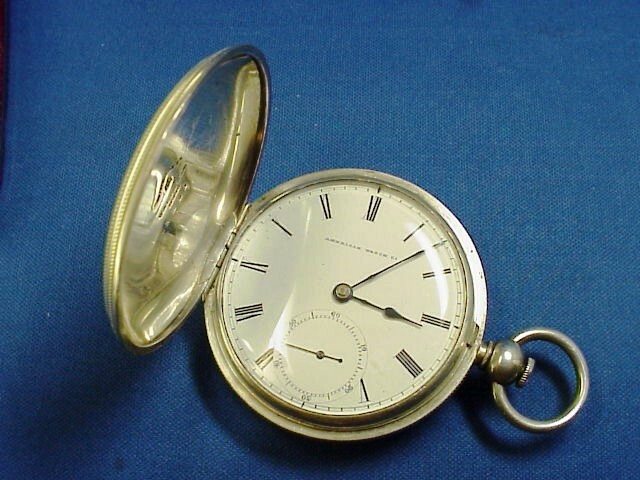 There were many watch companies in England and Switzerland that produced watches of much higher quality and timekeeping abilities available during this period, but they were also much more expensive and repairs and replacement would be more costly and difficult. 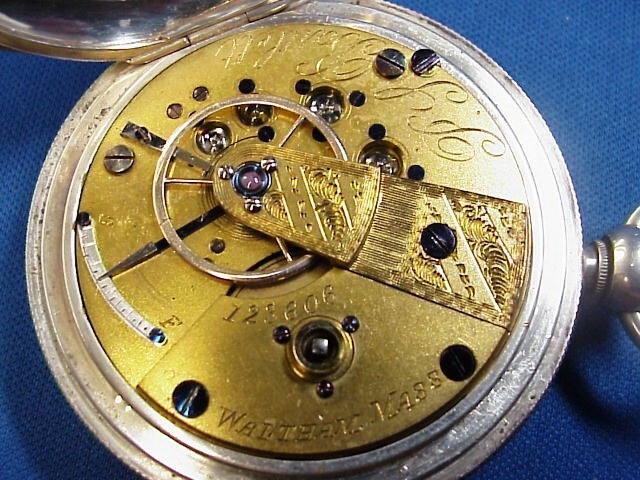 Waltham’s unique methodology of interchangeable parts and mass production made this watch much cheaper and easier to repair than its European counterparts, along with R.A. Robbins (Waltham’s president) strict quality control, gave the USMT a quality, durable and functional timekeeping instrument. The end of the Civil War also signaled the demise of the USMT. Its members were unceremoniously dismissed from service without severance or recognition, but they were allowed to keep the watches they were issued. I have no idea how many watches were issued and simply cannot find even how many people were put in service for the USMT other than they employed the use of former railroad men and (women!) in their ranks. Their service and devotion was amazingly unrecognized and ignored until 1898, when they finally received thanks and letters of recognition by the federal government. The story of this watch and its owner has unfortunately been lost. This happens all too often when collectors suffer from “tunnel vision,” focusing totally on their own interest and ignoring the sometimes more important history of previous owners of the piece. If only this watch could speak for itself—maybe even in Morse code—what a story it could tell! My thanks and recognition for photos and text to Cindi Verser, museum specialist and resident telegraph historian, at the Mariners’ Museum, “Lincoln in the Telegraph Office: Recollections of the United States Military,” by David Homer Bates, Unitedstatesmilitarytelegraph.org, civilwarsignal.org. David Mycko is a WorthPoint Worthologist specializing in antique and vintage watches.